This book tells the story of a society reversing deeply held worldviews and revolutionizing its demography. In parts of eighteenth-century Japan, couples raised only two or three children. As villages shrank and domain headcounts dwindled, posters of child-murdering she-devils began to appear, and governments offered to pay their subjects to have more children. In these pages, the long conflict over the meaning of infanticide comes to life once again. Those who killed babies saw themselves as responsible parents to their chosen children. Those who opposed infanticide redrew the boundaries of humanity so as to encompass newborn infants and exclude those who would not raise them. 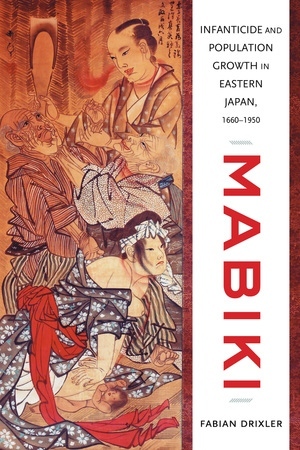 In Eastern Japan, the focus of this book, population growth resumed in the nineteenth century. According to its village registers, more and more parents reared all their children. Others persisted in the old ways, leaving traces of hundreds of thousands of infanticides in the statistics of the modern Japanese state. Nonetheless, by 1925, total fertility rates approached six children per women in the very lands where raising four had once been considered profligate. This reverse fertility transition suggests that the demographic history of the world is more interesting than paradigms of unidirectional change would have us believe, and that the future of fertility and population growth may yet hold many surprises. Fabian Drixler teaches Japanese history at Yale University. Watch an interview with Fabian Drixler, author of Mabiki, on Yale University's The MacMillan Report.